Well howdy friends and neighbours - hope you all had an awesome Christmas and are looking forward to embarking on a hobby-filled new year! Santa brought me a nice wodge of cash so I'll be having a careful think about what to spend that on soon - though I definitely need to start off with some new brushes and a few paints! Rassai watched as the light gradually faded, his vision narrowing to a slit before the blackness engulfed him once more. His body tensed as he anticipated the pain to come. He wasn’t waiting long, as the needles slid their way through the scarred tissue into his central nervous system, his body exploding with the sensation of fire as his mind was overwhelmed by the sudden sensory input. So what do we do at this time of year other than take stock of things and look to the future to try and figure out what the next twelve months has in store? I recently took the above picture to remind myself just how far my marine collection has come since I decided to revamp things just over two years ago. So what is still left to do? And what is still missing that I'd like to add? With Christmas fast approaching and almost two weeks off work, I'm getting pretty excited about being able to make some decent hobby progress once more. With that in mind, and with my wife having taken our daughters to a nativity and church party on Sunday, I had a few hours to myself to get some work done on my Tau once more. 2015 resolutions - how did I do? 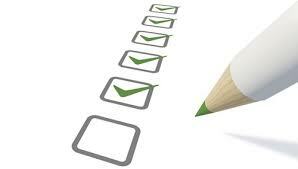 Morning all, so here's the promised review of my resolutions for this year. I'm getting nervous myself to see how I did! 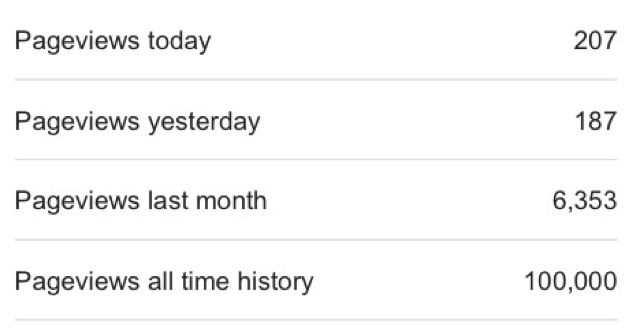 Hit at least 100,000 page views. Tick! Squeeze some money out of google. Fail! Complete codex reviews for Dark Eldar and Blood Angels. Fail! Finish my 1850pt Dark Eldar list (painting it, that is). Tick! Re-paint Astorath the Grim. Fail! Exceed my 2014 win ratios for Dark Eldar and Marines. Fail! Beat Mj more often than he beats me (40k only). Tick! Actually get my Blood Angels and Eldar armies into some games. Sold, so N/A! Attend and place in the top half of Blog Wars 9. Tick! Run MAD league bloodbowl season 2. Tick! Run more kill team events at MAD Wargaming. Tick! So, a total ratio of 6 from 11 potential targets. Not bad, but room for improvement! Squeezing money from google - I think this was a highly ambitious target, expecting to receive over £60 in revenue from clicks on the ads on my blog. I doubt I'll carry this forward to next year, though I'm obviously grateful for anyone who takes the time to click an ad. Codex reviews for Dark Eldar and Blood Angels. Gotta hold my hands up here - whilst I pretty much abandoned the Blood Angels early in the year (the codex was pretty uninspired and certainly uninspiring I think) I've got no excuse for not reviewing the rest of the Dark Eldar codex. Next year I think I'll likely begin by working on the Tau reviews using my new format and see how we get on - I reckon reviewing two full codices is a reasonable workload. Re-painting Astorath the Grim. Yeah, this should have easily been achieved. I may complete this early next year and get him up on ebay since the rest of my blood angels are gone already. It's clear that this year I haven't been quite so successful with my main two armies in general - I think I need to sit down over the Christmas period and have a rethink of my strategies with them both to refresh things for the New Year. So, what areas am I going to look at for next year's resolutions? I realise it's a bit early, but I'll formulate more specific objectives from these areas. The main one has to be running a successful event - that's clearly going to be my biggest challenge. Gaming. Well, having achieved my challenge of winning more games against Mj I'll have to set myself the next challenge. Similarly speaking I liked the constantly evolving challenge of improving on my win ratios - I may however look to set out exceptions for things like experimental lists. 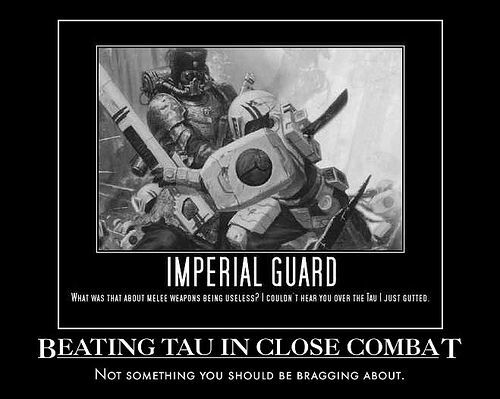 I'm going to need to challenge myself with the Tau too from a gaming perspective. Painting. This is always an ongoing thing, and I do like having a stock of unpainted models to keep me going when I can't afford to buy anything new. I may however look at formalising the list of things I still need to paint, possibly setting a points target of painting progress each month. Blog stuff. Well I will need to set myself a challenging target, with a view to increasing traffic to the site - hopefully hero for a day will help with this, but more than anything I think I need to look at putting more effort into constructing posts properly, and I'd love to get a regular battle report slot in too - possibly doing one fully realised report a month - these games take much longer to play. I may look at roping in some friends to possibly get some video work done to accompany the reports too, we'll see. Hi all - a quick update today for you regarding the event I will be hosting next year - Hero for a Day. I haven't been able to make much progress recently in developing missions due to my day job interfering in my evenings, and the need to crack on with building and painting my next wave of Tau (due to be finished by the end of January, eek!). 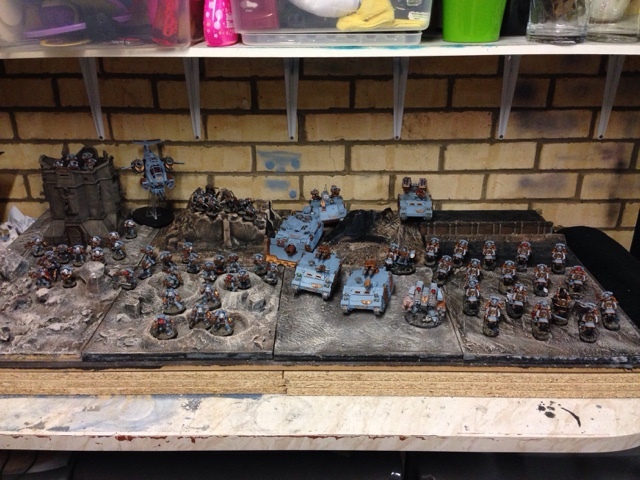 40k Army Building - assembly! So, where do we start when it comes to assembly (and no, I don't mean by reciting "Good Morning The Burning Eye, Good Morning Everybody"). In the meantime though, what have I been up to over the last week or so? Best not get on his naughty list! Hi all - bonus post for you today, as last night I decided to have a go at recreating converted piranhas I've seen on the internet. I love the rules for the piranha, little speedy anti-tank units are great fun to play on the tabletop, particularly when they can drop out annoying little drones too. I don't like the layout of the official GW model though, so decided to have a go at recreating something I've seen done elsewhere that makes them look a bit more like a mini-flyer than anything else, and really emphasises their speed through the appearance of the model. A little perspective - and frustrations with UPS. Hello hobbyists everywhere, welcome to this week's update post! So after last week's progress I got all inspired and on Friday night I broke out the paints and a classic film to watch and got cracking once more. Hobby update - and a new poll! Hello, people of the internet, this is me calling - and I've got plenty of progress to report today! Hi all - welcome once again to funny Friday - this one is particularly appropriate as last night I decided to charge a bloodthirster with Lysander. The only really surprising part about the outcome was it took four turns for the bloodthirster to kill him (with that zogging great D-axe!). Of course if I'd been a bit more patient I could have shot it to death quite comfortably with my storm raven, but how cowardly would that have been? Hero for a day mission structure, and a new poll! Greetings all - so despite work taking an unpleasant amount of my not-at-work time at the moment, I'm still putting quite a bit of thought into the organisation of this event, and I thought it would be useful for me to lay out the structure of what I'm working on so that those of you thinking of attending can see what you're in for! Greetings all - time for a hobby update once more! Sadly work has been taking up a lot of my 'free' time this last week, and with two girls under three I don't have a huge amount anyway. Still, I've managed to get a bit done in my lunch breaks and the odd hour snatched here and there. It's time for some more thoughts and updates on the charity gaming marathon I'm going to be organising next year. Oh yeah, and an announcement! There are a couple of things to talk about here - first whether or not the event should be run as a team event or solo, and second would it be preferable to have the results of the games influence things throughout the day. On the first point then, I'm initially aiming to get around 20 people signed up to participate - not big by any means but at this stage I figured it would be easier to manage and see the event as being a success at this scale initially, and only if demand is greater would I need to expand things out to include more participants. On the second point, the option was then open to decide if I wanted 24 hours of gaming with each player playing a series of single games against their opponents. One of the key things I really want to encourage as part of the event though is a good atmosphere and spirit throughout the day - I'm aware that we are all going to get tired and probably a little fractious, so I figured a team situation would work better with no outcome of the day riding on a single performance, not to mention bearing in mind that the whole purpose of the event is to raise money for a good cause. How do I see a team event working? I'm as yet undecided whether to try to get four teams of five players or two teams of ten, and I think this may depend on the factions available to players as above. I'd initially planned to ask the potential participants to see what they thought about how they'd like to see the games organised, in other words should I run the event as a typical tournament with each game being completely separate to the others, or should it be more of a narrative style event? I'd still love to hear your thoughts about how best to achieve it, but in this case I think I'm going to go with my gut instincts and what I know and love - so the games in the event will all be interlinked, with the results across the whole room influencing the particular mission and special rules of the next game. At the moment I'm thinking of recording the victory points won by each team in a round, with three possible results affecting subsequent games - so attackers defeated, deadlock and defenders pushed back. So now for my announcement - I'm planning on writing a short background piece to set the scene for each mission, and I've secured someone to narrate these for us so each round will be prefaced by an audio intro. Those of you familiar with the dark city forum will probably recognise the voice! Here's my second main point then, and this will be the focus of the next vote, which will go live on Wednesday. The standard games I'd like to vary too to keep the tactics fresh, so some may require non-standard deployment, or represent an ambush etc. I've also thought about using planet strike rules and zone mortalis (which would obviously be limited by availability of scenery, as I don't have it, or the rules). Let me know what you think! Finally, timing, I'm inclined to run the event from midnight-midnight, partly from the point of view of only needing the room for a day, but also because it would at least let us get a bit of sleep on the second night rather than going through a whole night. What do you all reckon? As a final point then - anyone who'd be willing to give this a bit of publicity on their blogs, please feel free, there's enough momentum in the project I think for it to be ready to gain a wider audience now. Hi all, and welcome to the first of my unit reviews for the new Tau codex - I'm starting at the top with the Comander - enjoy! Before you get there though, please have a look at the poll on my blog - I'm trying to organise a charity gaming event in the UK and am looking for community feedback - please please vote as the feedback will influence the event and how it's run - there will be a new poll up each week focusing on various aspects of the proposal. Just about as flexible as they come – the Tau Battlesuit equipment locker overfloweth, from cheap horde killers like flamers and airbursting frag projectors, through high rate of fire guns such as the burst cannon and cyclic ion blaster to the elite killers of the plasma rifle and tankbusting fusion blasters, not to forget the long range high strength missile pods, the Tau Commander has just about every option of man-portable weaponry covered (ok, he doesn’t carry a D weapon, but you get my point). With a high BS of 5, that shooting is likely to be delivered exactly where you want it too. That’s not all though, because with the advent of signature systems and other wargear, the Tau Commander doesn’t have to be a gun platform (indeed, probably the most common loadout for him doesn’t actually require him to take any weapons). By not shooting, the Tau Commander is able to apply the benefits of several signature systems to his unit, making them substantially more effective – namely twin linking their weapons (in effect), ignoring cover and granting them either monster hunter or tank hunter. The third role this model is able to fulfil is that of a disruption unit. Again, through judicious use of possibly the most ridiculously underpriced equipment in the game, he can make a unit within close proximity suffer from ‘gets hot’ on their guns, and if you do manage to kill him, can become a sucker punch as his suit overloads, exploding and showering everyone in the vicinity with shards of hot metal. Finally, as if all that wasn't enough, the latest addition to the line of battlesuits is the 'Coldstar' option. This suit grants the model the ability to fly, though it misses out on many of the useful rules flying monstrous creatures benefit from, and ceases to be able to take a variety of weapons, but against some armies the ability to only be hit on a 6 could be very handy indeed. Well given his flexibility there are plenty of ways and therefore costs to take this guy. Realistically don't count on less than 150, and up to about 200 is fairly common if you want to do more than just buff something else. i may edge myself out onto a relatively thin branch of the tree here and say that this is probably the single most synergistic unit (adopts Jeremy Clarkson voice) in the game. His wide array of buffing equipment, and wound tanking ability mean he can either protect or enhance as you see fit, and his own shooting is pretty handy too! Quite honestly he's pretty essential. You can take a tau army without one but it's generally a lesser army because of that. How many dice will you need? Not a huge number as you might imagine for a single model, though a maximum of 8 shots is possible, so more than most characters. The Commander has a naturally high ballistic skill, so his chance of failure in his own shooting is low, which combined with the potential to gain invun saves or provide rerolls to other shooting means he's a pretty reliable beast too. On his own, using his shooting probably just a strong cheddar. Used either as a drone controller or buff unit, probably a good tasty Camembert. The Tau Commander is probably going to be the glue that holds your force together - he's that important. The whole Tau army works on the basis of the synergy between units and the combined total being stronger than its constituent parts, and the Commander has the ability to increase the effectiveness of those units by a huge margin. Don't leave home without one, even if you do want to take another HQ. Hero for a Day - polling starts! Who better than Lysander to be the poster boy for this event? 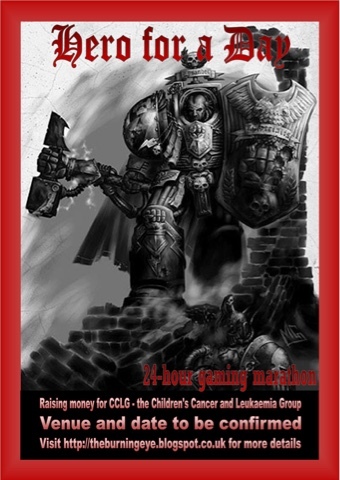 so, my first poll is up on the blog - I've started nice and simple, would you be interested in attending a 24-hour gaming event for charity? Obviously at this early stage I'm simply trying to gauge interest in such an event so that I can work out how big it needs to be (roughly). For all you other bloggers out there, if you want to re-share or post about this idea please feel free, any publicity you can give to the proposal is going to help. Each poll will be live for a week, and I'll publish the results the following week along with the next poll going live. Would you like to see the event progress as a narrative throughout the day, with results of the first round affecting the following rounds? Which race should occupy the 'home' world? Personally, what I would like to do would be for it to be a team event (players would be allocated to teams based on the armies they have available, so there would be no need to have a team ready-made to attend), set out with a simple ladder type campaign for the day, so the results of the first games would affect the scenarios played in the following round etc. All set against the background of war descending on an occupied world (I'd like to do something different to the norm though, perhaps a retaliatory strike against a world recently conquered by the Tau for example?) This would allow scope for battles to take place at different scales throughout the day, possibly even with players using different armies if they wished, with special rules applying to individual rounds (a particular favourite I've played previously involved my army conducting a fighting retreat, gaining points for delaying the enemy army rather than destroying units). All this is up for grabs though - I've obviously been thinking about things but what I would really like is lots of community feedback so that the event is what would interest the people taking part the most, bearing in mind the day is about doing something for charity rather than personal pride (hence why I'm leaning towards a 'team' event). I've got a proposition to put to you all, for your thoughts, views and suggestions (and hopefully support in the longer term). I was very sad to hear recently that BlogWars will be disappearing next year, though equally excited to find out that Alex has plans to do something different instead. Now, I've been toying around with an idea for, well, ages quite frankly, and circumstances recently have given me encouragement to give it more thought and effort. Those who know me will understand that I'm not a WAAC competitive player, but I enjoy playing the game and playing as hard as I can within a game to win. That's why I liked the sound of BlogWars when I first read about it. I've got a hankering to try and run my own tournament, but a tournament with a twist. My idea is not so much a competitive event but a 24 hour gaming marathon, with each participant having raised a sum of money for the event's chosen charity in order to enter. Here's where things took a rather more personal turn. I'd always felt that such an event would be best linked to a charity such as Help for Heroes given the context of the game, but recently the son of some friends of our family was diagnosed with a tumour. George isn't even three (in fact he's only a couple of weeks younger than my own eldest daughter, and we met his parents on an ante-natal course). Thankfully he's responded to treatment and following an operation and another course of treatment things are looking positive, but I obviously want to be able to give something back to the people who have allowed him to be in this position. Now I've got a name for the event - Hero for a Day. I also know that I want it to be a 24-hour marathon style event rather than a more structured player vs player, so I'm thinking more about having two teams participate, with the results of each game feeding into the team performance. I've run team campaigns before and I really think they have something to offer in this respect - they allow for specific missions to be designed with armies selected from those available within the team that benefit from those mission parameters, and they also encourage a deeper involvement between all the players taking part than everyone in it for themselves, which let's face it appeals to the purpose behind raising money for charity. I have no dates set yet for such an event, and I've only ever run local campaigns at my club before so this is all fairly new to me personally. On that basis, I'm asking you, my online friends, for your thoughts. Please let me know if this is something you'd like to get behind, either by sponsoring or participating (both in organisation and on the day), and if you have any ideas as to how it could be organised or some suggestions for missions please let me know in the comment section. I'll try and keep everyone appraised of how things are going on the blog, and if things come together well I'll also be looking to set up a forum to allow for discussion of organisational matters (and for participants to discuss mission tactics etc). Keep your eyes peeled for a series of polls on the blog therefore as I come up with and take ideas/suggestions for how things will go - I'd really love to make sure this event is a blend of what the people attending would like to do. CCLG (Childhood Cancer and Leukaemia Group). They are a small charity that relies on volunteers and is based in Leicester but their work is national. The research they've done has informed the protocol that is followed for the treatment of Wilms tumours like George's (amongst other childhood cancers). Hi all, so here I am back with another update for you - today's post is a tale best told by a bastardised version of Shakespeare, so here goes! Of course what I'm talking about is one of my least favourite parts of the hobby - basing miniatures. 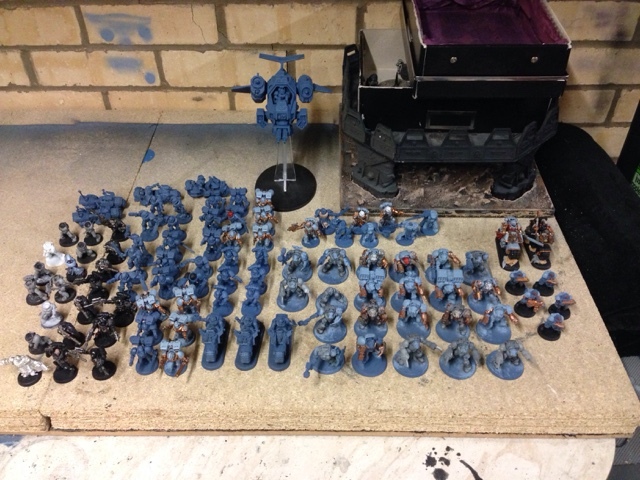 I was looking at my marine collection the other day and I realised just how many models there are that don't have bases done. Now that's kind of ok since most of the minis aren't painted either, but I thought wouldn't it be wonderful if when I get round to painting those figures, I don't have to worry about doing the bases because they're already finished? So here was the scale of the task at hand! 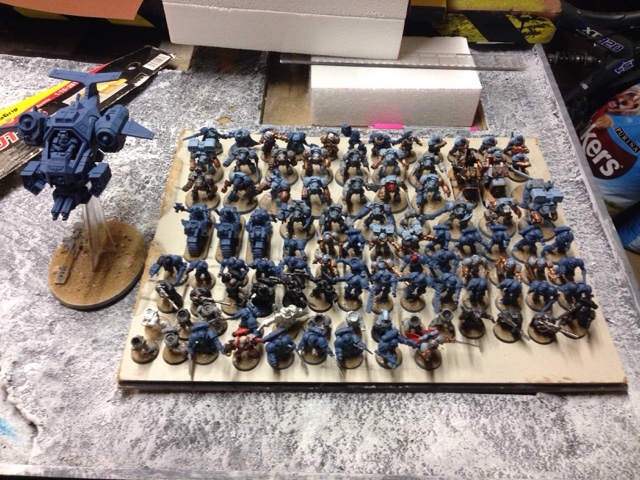 Now just so that you earnest, dedicated types don't have to count them all (and because I missed a squad off the picture), that's 22 terminator bases, 9 bikes (well, five since four of them don't yet have bases at all), 1 flyer and 76 infantry. Quite the task, but last night I sat down with all the enthusiasm of someone who didn't want to go to work the next day and got cracking. Ever model based with sand, woohoo! Now the problem of course is that sanding them is the quick bit, and if I don't get paint on them now the sand will wear off. Wish me luck! TBE out! Hi all, so after lots of thinking about the new tau units and formations, and trying to figure out just what I want to do with my list using the new codex, I come to this - my list for the next round of games against Mj, Ryan and Martin in the MAD tale of four gamers. Well first off I think it's sensible to be cognisant of the armies that you'll be facing. That's not to say I can (or want to) tailor my list particularly, since 1) I don't know what my opponents are going for and 2) there's plenty of variety already in what I'll be facing simply because of the armies chosen. 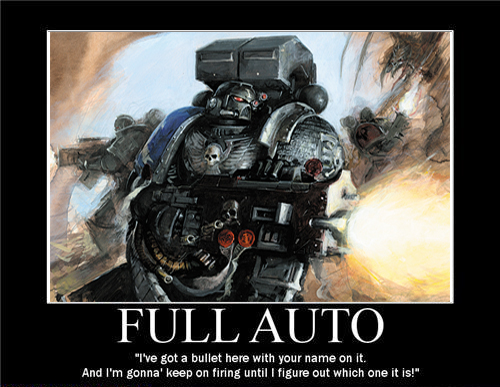 So, the other three armies in the tale are 2 space marine lists and a chaos list. Of the two marine lists one is using iron hands tactics and the other imperial fists. What can we take away from this that's going to be useful then? 1. I'm going to have the worst armour save around - with the exception of cultists even my fire warriors are largely outclassed in that department. It also means that having ap3 weapons is going to be useful indeed. 2. I can't scrimp on anti tank firepower because all three opponents are capable of bringing plenty of vehicles. 3. I'm going to have to face flyers, and therefore bring some AA power myself. On that basis therefore, I had a choice to make, do I stick with the combined arms detachment I've used so far, gaining objective secured for my troops units, or do I use the formations in the codex, foregoing obsec in the search of greater damage potential? I think the key deciding factor in my decision is this - the codex does not refine the points costs of the units in it. At all. So, fielding a combined arms detachment, whilst extremely useful for obsec, grants me precisely zero additional power over the old book, with the exception of giving me access to the new units. In that respect I found it quite disappointing, but to my mind the formations make up for this, bringing quite a lot of increased firepower and utility to the army. So, formations/detachments it was to be. Question is, which? Well there were two key things to bear in mind here. First, sadly, is funds. I've got until the end of December to get all this stuff built and painted, so I was going to have to build off what I've already got in my collection to an extent - I may have generous relatives but money given for my birthday wouldn't pay for a whole new army. Second, is the individual costs of the formations, many of which have quite a high entry points value to them, such that I'd be able to include a maximum of two in my army. 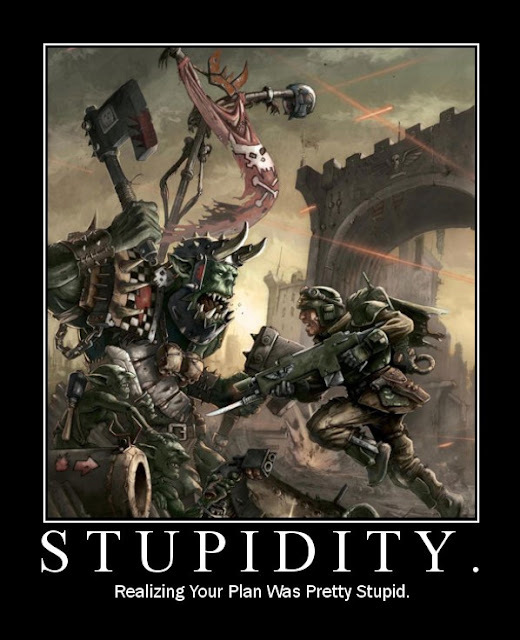 As you may have seen from previous posts on the subject, I've toyed with several options for lists, but in the end, my mind was made up by something I read on Advanced Tau Tactica the other day, and that is just precisely what implications the Hunter Cadre formation has in respect of the use of Piranhas in particular. I'm getting a bit ahead of myself though - I bemoaned the poor BS of the Riptide in the last round, rarely being successful with getting it on target. As such, I figured using the hunter contingent was going to be a big plus, making my units BS4 if I concentrated fire with them (which let's face it is a sensible thing to do anyway). As a minimum therefore I needed to include a Hunter Cadre and an auxiliary formation. Thankfully, one of the auxiliary formations consists of a single unit of drones of whatever type you desire. So there was my first choice made, 4 marker drones would give me the maximum amount points to pour into a Hunter Cadre to make it viable. The basic Hunter Cadre then operates on a similar basis to the CAD, but has greater minimum requirements in exchange for some pretty nifty benefits. First, and the big hurdle for me, is that it needs three troops units. Now as you may have picked up from my other articles on the Obsidian Enclave, I wanted all my troops units to be mobile and therefore transported by a devilfish. This was going to be tricky, since at 80pts each they would eat up 25% of my allowance before I'd even pulled a trigger. First compromise therefore. I would take 2, and one unit of fire warriors on foot. Second question was what troops units to take - Kroot were out for fluff reasons, so I was left with strike teams or breacher teams. The strike team is the fire warrior unit we all know and marmite. The breacher is the new unit that I reviewed as a test bed for my new review format. I have to say, I'm a big fan, they're definitely high risk/reward, but bearing in mind the likely need for AP3 weapons they seemed to fit the bill perfectly. I stuck in a pair of them at their minimum unit size with no upgrades. 10 shots even without a boost to my BS would give them 5 hits and that should average out at at least 4 wounds with no armour save most of the time. Their highish strength of 6 would also allow me to use them against lighter vehicles as well. Next I needed a heavy support unit. Ideally I'd have taken the skyray but for some reason (ok yes I can see why) it's not selectable in the Hunter Cadre. For those of you out there who are wondering, the Skyray has networked markerlights, so would easily allow a large combined fire unit to benefit from them. With my previous point about power armour in mind, I figured that the Ion Cannon Hammerhead was probably the next best choice. I considered the railgun variant with submunitions but to my mind the potential AT of the railgun is offset too much by the AP4 on the submunition shell. I next needed an elite choice. 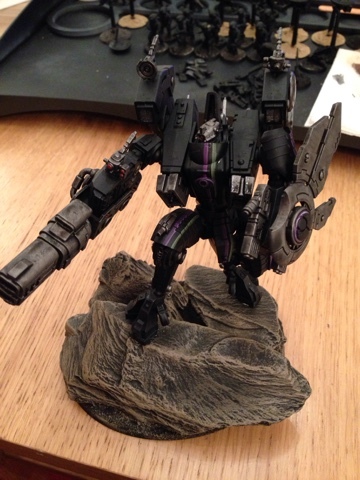 Now I've already got a Riptide as we know, but at 210pts he's still a big chunk of my allowance on one model. Granted, he should be more reliable this time with all the BS improvements there would be available, but I felt he unbalanced my list too much last time, and wasn't going to get burned twice by the same mistake (we learn from our mistakes you know, honest). Instead therefore I toyed with the idea of a Crisis Squad but in the ended opted for the Ghostkeel. Reasons! I hear you say, what are your REASONS? Well, put simply they are thus. Crisis teams are great, I do love them and I want them very much in my army. How I want them however, is as part of the Retaliation Cadre so that I can guarantee their arrival on turn 2, with increased BS, possibly by as much as +2 without recourse to markerlights. I was also extremely nervous about the potential number of tanks I'd be facing from the Iron Hands list, particularly in the form of a trio of vindicators, so I figured I'd take possibly my new favourite model in the line, the Ghostkeel. With a fusion collider and twin fusion blasters it has good anti tank potential, and by adding an early warning override and a velocity tracker it could target flyers early too. It's got an unbelievably good cover save, and if the worst did happen, it's also got the option to force a unit that has declared they will shoot at it to snap fire, and thus would completely negate the apocalyptic ignores cover blast from a vindicator squadron for a turn, hopefully long enough for me to deal with it. 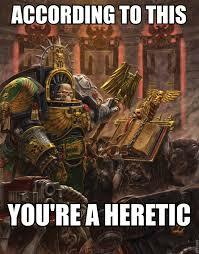 Speaking of which, how do you deal with a trio of tanks with front armour 13 on turn one, bearing in mind they can then bring the unholy wrath of hell onto you if you don't succeed? Well, this is where the trick I mentioned with the piranhas comes in, and it makes use of both the Hunter Contingent and Hunter Cadre special rules. I've already touched upon the increased BS granted by the Hunter Contingent of three or more units focus their fire on a single target, gaining +1BS and sharing their special rules and any markerlight abilities. That's very important for a unit with native BS3 and a single shot weapon. The real trick though is that the Hunter Cadre allows a unit to move flat out and then shoot, provided it's within 12" of the commander at the start of the phase. As a fast skimmer the piranha can move up 12" in the movement phase, then slingshot itself forward another 18" in the shooting phase before unleashing that 18" melta (9" double dice for penetration). Assuming I want to keep the double dice therefore that gives me a potential range of 39", threatening almost anything on the board on their first turn. They would also nicely fill my requirement for a fast attack choice in the Hunter Cadre. So that left me with just one model to fit in - the Commander. You're pretty limited here as it has to be a Commander, but that really doesn't restrict you much, as they are extremely versatile. They start quite cheap at 85pts, but can get very expensive once you start adding toys! 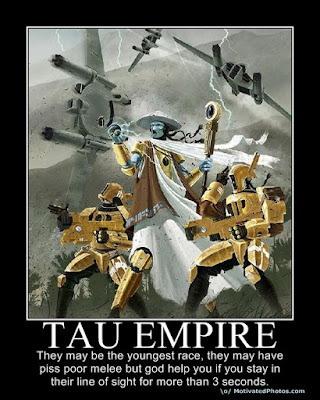 Now what's really nice I think about the tau book is that where other codices get relics, or rare weapons etc, the advanced nature of the Tau means these are actually more experimental systems and so it's dead easy to justify there being more than one of them in the empire, they're just very uncommon. The key one here I think is iridium armour. It grants the commander +1T and a 2+ save on top of all the normal benefits of crisis armour, so that was in. He needed some guns of his own, so a pair of fusion blasters alongside the obligatory velocity tracker meant that he too could target incoming flyers. I added in a drone controller so that if he joined my marker drones they would use his BS5, making them much more useful to the rest of the army. 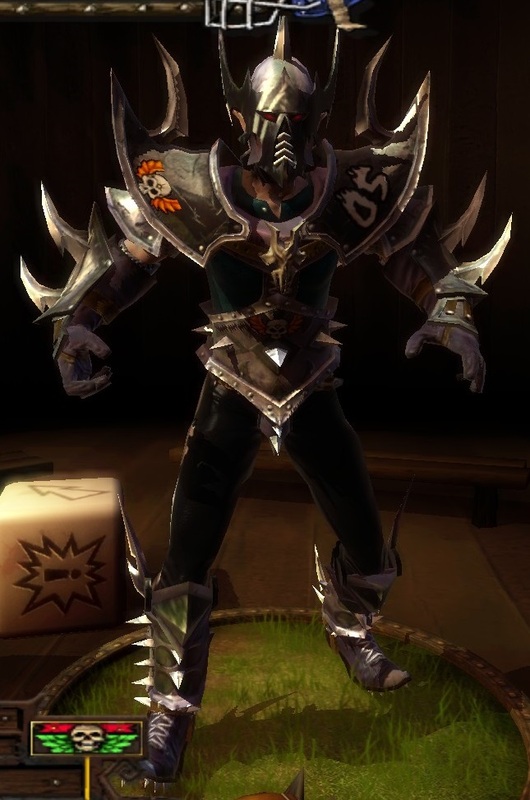 With points running short I added a few other pieces of my favourite gear to make him extremely flexible. A command and control node, and a multi spectrum sensor suite meant if he didn't fire, any unit he joined would get re-rolls to hit and ignores cover, and the neuroweb system jammer is a steal for its cost, forcing a single enemy unit in 12" of him to have the gets hot rule applied to their weapons. Last night I played a test game with this list that illustrated what I think are a few flaws. This mainly revolves around the commander. Partly my over enthusiasm meant that he got exposed and picked on early in the game, with a pair of grave gun bikes and some melta bikes proving that he needs more than just marker drones as ablative wounds. It also illustrated that none of my other units are really suited to him joining them, so he needs to be fairly central in terms of board placement, and his weapon ranges should probably be equivalent to the marker drones so he's more effective. I didn't get much chance to use his signature systems but once again, because of him needing to be part of another unit for this to work I was limited as to how I could see them working with the rest of this list. So, semi-drastic action required before the games that count get going, what did I learn and what did I change? Well, first as I mentioned I absolutely need to keep the commander more in the game, without exposing him too much - he's a good tank for the drones, but too much fire and the unit will still disappear. The markerlights are extremely useful though, and their hits meant that on the first turn my piranhas could target my opponents fast skimmers at BS4, ignoring their jink saves, netting me first blood. I want to keep them alive longer so I did away with the Command and Control Node, Neuroweb System Jammer and the Multi Spectrum Sensor Suite, replacing them instead with a pair of shield drones and swapping the fusion blasters for a pair of missile pods. 4 S7 AP4 shots at BS5 never hurt anyone but their target eh? That gave me a few points to play with, so I beefed up the pulse rifle squad to 10 members and added in a smart missile system support turret. That left me with a couple of spare points so I put the NSJ back onto the commander - it may never get used but there's no sense in underspending on your list. I'm a bit more comfortable with this list now, I know that the piranhas are a viable tactic, particularly with markerlight support. The Breacher teams performed superbly until they felt the wrath of a storm talon, I perhaps need to be a little circumspect about using them, picking on things and then getting them protected somehow, but those two five man teams took out a pair of bike squads and most of two scout squads. The Ghostkeel was also brilliant, applying the coup de grace to the enemy warlord, then single-handedly taking out a unit of centurions through a combination of shooting and combat before vapourising a thunderfire cannon and its gunner. My opponent basically didn't bother shooting at it the whole game thanks to its cover save and holophoton countermeasures, so it was pretty much unhindered. The only slight disappointment was the fusion collider (which managed to scatter back and hit myself on one occasion) so I would seriously consider swapping that out for the cyclic ion raker, even with the reduction in anti tank potential. I was pleased with the performance of the hammerhead too, though it did get shaken a couple of turns in a row, hampering its effectiveness. I still think the potential for a large blast AP3 weapon is worthwhile though, so will be sticking with the ion cannon for now. 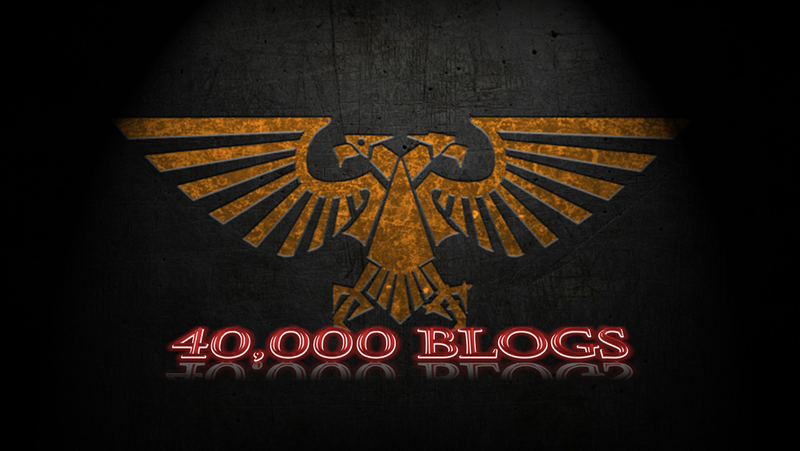 Well I've read a lot of posts on blogs recently with my fellow bloggers reaching significant milestones. Now it's my turn! Last month I hit 250 posts, which I didn't make a thing of, mainly because it just proves what verbal diahorrea I have sometimes! This one is the biggy though, and one that I hoped to reach when I did my Ho by resolutions for the year. 100,000 views! It's a cliche, but a true one - you are the people who have achieved that for me, and for that I am very grateful, so thank you all! 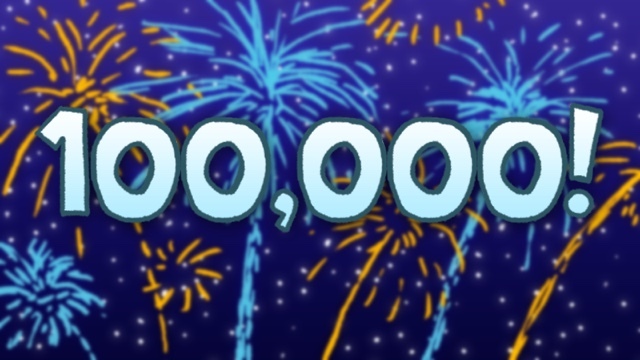 Here's to the next 100,000! Ok so I failed in my challenge to get my own personal funny completed for you, I'll try again next week! Hey everyone, today I've got a post lined up for you on background - one of my favourite parts of the hobby! This post is going to be a working example of how I build up the background to an army as a whole - not so much focusing on individual characters, but rather things like the origins of the army and their fighting style, colour scheme etc. Hi all, I've got a battle report for you today, as the Iron Fists took on an alliance of Imperial Guard and Adepta Sororitas. The battle was set for 1750pts, and we played the escalation mission from the maelstrom section of the rulebook. 2x full bike squads, one with two melta guns and an attack bike with multi melta. The second had no upgrades. To that I added two sniper scout squads, one full strength and one five-man, and a squad of scout bikes to make up a 10th company task force. A cannoness, three exorcists, two flamer squads, and two melta squads, a multi melta immolator and a lascannon turret. Oh yeah, and a culexus assassin! I deployed second but failed to seize the initiative. For warlord traits my opponent could discard his opening tac objective hand and re-draw it. I got stealth (ruins), which meant my centurions would be getting 2+ cover! I kept the scout bikes back in reserve, and won the roll off to deploy the small scouts in the centre of the board, and the larger squad on my left flank. The Culexus assassin shoots at the scouts, but their 2+ cover saves them comfortably. An exorcist opened fire on the bike combat squad with the multi melta on my left flank, killing one, whilst the wyverns opened up on the small scout squad in the centre of the table. The mortars were as accurate as ever, causing 22 hits and 12 wounds. Thankfully I only lost 3 of them, having rolled incredibly well for my armour saves. That saved my conceding first blood, and the two remaining exorcists opened fire on the two other troops bike squads, killing one from the combat squad with two melta guns on my right flank. All the bikes advanced, leaving just the thunderfire and the centurions to do some shooting. They didn't let me down, and despite the wyverns being partially hidden by a ruined building, the centurions managed to strip a hull point, and the thunderfire dropped its payload directly on top of the tanks, wrecking them both.The large bike squad in the centre of the table charged the Culexus, causing a single wound. The two outflanking melta squads arrived, one on each flank, lining up shots against the thunderfire cannon and the multimelta bike squad. The guard squad shot at the melta combat squad on my right, killing three of them (lots of plasma) though 1 gun overheated and killed its bearer. One of the exorcists finished off the last bike from that squad. The melta squad and exorcist on my left combined their fire to shoot at the attack bike's squad, causing just a single wound on the attack bike itself. The three storm bolters on the vehicles on that side of the table then opened fire, killing twoo bikers! The other melta squad on my right destroyed the techmarine, having passed their act of faith to ignore its cover. 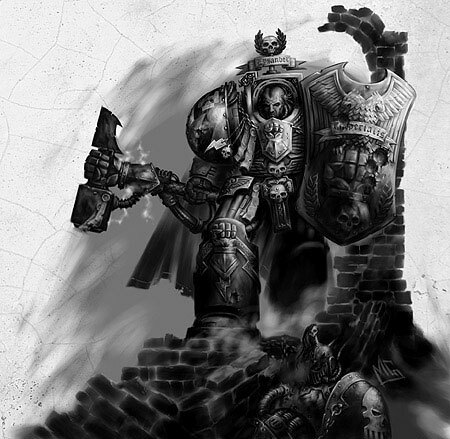 In the central combat, the Culexus killed the biker sergeant but his comrades wounded the assassin a second time in return. All my reserves arrived, the scout bikes popping up right in the rear right corner of the table, stripping 2 hull points off one of the exorcists on that side, whilst the large sniper unit downed three of the melta-bearing sisters on my left flank. The multi melta missed its target, whilst the Captain opened fire on the melta squad that had vapourised the techmarine, killing one before charging into combat and finishing them off. One of the storm talons finished off the melta squad of sisters on my left flank, whilst the centurions split their fire, wrecking the exorcist that the scout bikers had targeted, and the other two stunning the rhino on my right flank that had transported the melta squad. The command squad charged the guard squad in front of them, avenging themselves for the death of the melta bikes. The bike squad in the centre of the table finished off the Culexus, who'd had trouble wounding them thanks to their enhanced toughness. This turn I scored 1 vp for first blood. The platoon command squad advanced on the scout bikes, whilst the last squad of sisters arrived on my left flank - the disgorged flamer squad toasting 6 of the sniper scouts. The two remaining exorcists targeted the storm talon and the central bike squad, but only managed to kill a single biker. The centurions finished off the rhino on my right flank and took a 'hull point' from the lascannon emplacement that was hampering the movement of the storm talons. The scout bikes opened fire on the platoon command squad, leaving only one man standing who failed his morale test and fled the board. The large bike squad in the centre of the table failed their charge against the sisters squad holding an objective, but thanks to the storm talons and some nifty bike work from my Captain I managed to score supremacy for 2 vps and objective 5 for another. I led 4-1. 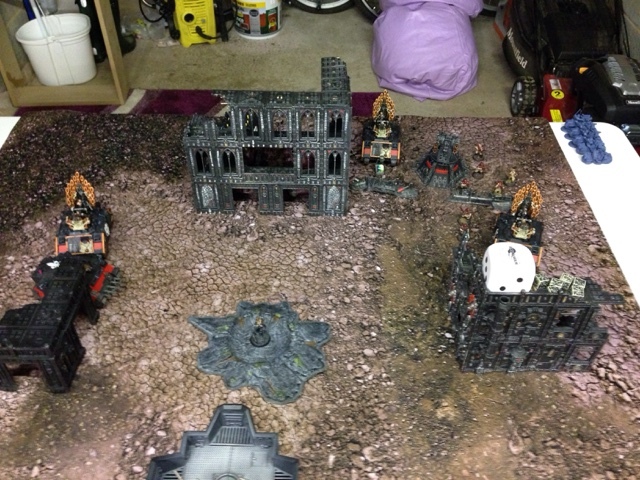 The second flamer squad dismounted, targeting the central bike squad along with the exorcist on the left flank. They took two casualties and a wound on the attack bike, causing them to fall back. The flamer squad further back on my left flank targeted the scouts again, killing two with the remaining pair falling back. One of the storm talons was forced to jink as it was targeted by the immolator's multi melta, but managed to avoid the searing blast. The rhino on the left flank finally killed the multi melta attack bike. The exorcist at the far end of the board on my right targeted the command squad, killing the apothecary I'd foolishly placed at the front of the squad. The centurions moved further out into the board, lascannon beams stabbing out into the lascannon fortification and causing it to come crashing down. 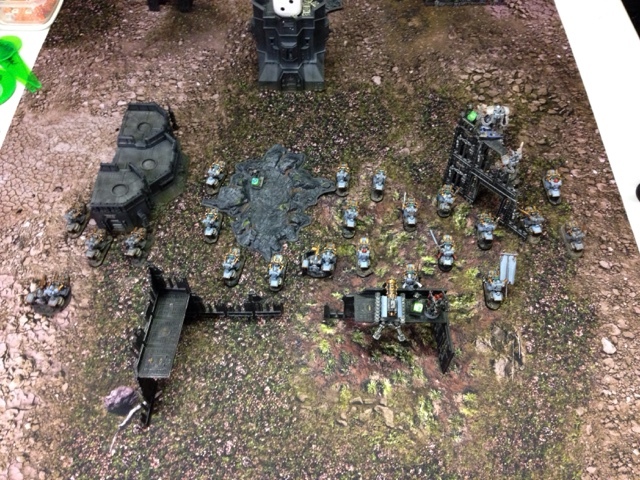 The storm talons combined their fire to destroy the immolator in a hail of assault cannon rounds and krak missiles. The large bike squad shot and then charged the squad of battle sisters in front of them, wiping them out as they fell back from combat. In the final act of the game (lunch was ready!) the small scout squad killed the heavy flamer bearer. The final score therefore was 8-4 in favour of the marines. In conclusion, the bike list worked really well, despite being fairly quickly thrown together. With a few more tweaks I'm pretty sure I'm going to be happy to keep this as the basis of a standard list going forward. On the flipside of that, bikes are very much the rock to the sisters scissors (see what I did there?) as the list is very full of melta weaponry but the ability of the bikes to jink that away neuters much of its strength. Till next time, keep rolling sixes! 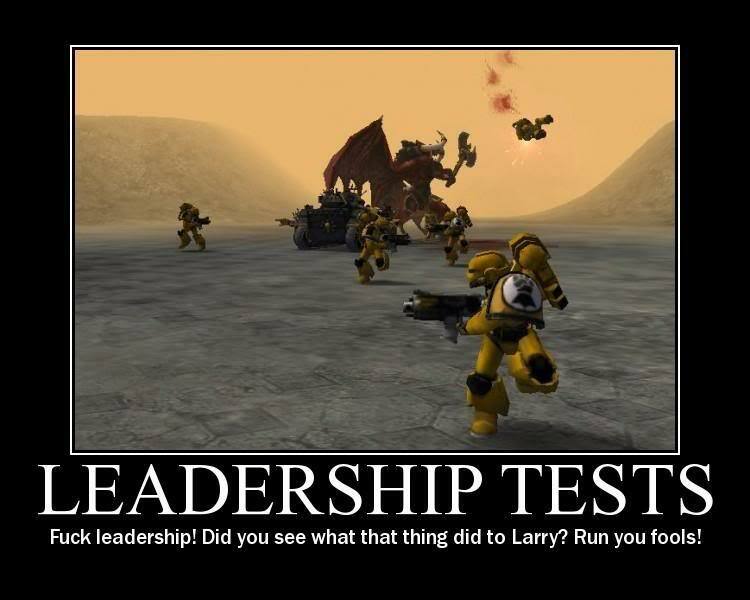 Hi all, somewhat later than usual but keeping with the Tau theme for now here's this week's funny friday. Next week i hope to have a burning eye original for you, grim darking up a country classic! Hi all, this post is kind of going to be a bit of a generic update on all things going on for me hobby-wise at the moment, starting with painting related stuff, then updating on games, tau list revisions and future plans. Hi all - two battle reports for you today from our Tale of 4 Gamers series. The first one I was up against Ryan's Marines, who had won both of their previous games in this round, whilst in the second I faced Mj's Chaos marines. Help, need a little help here! Ok, so maybe that's a bit over the top, but I'm kind of stumped at the moment as to where to go next with the Tau in the Tale of 4 Gamers series at my club (yup, we lost another, we're now down to 4). So far I did pretty well in round 1, round 2 has been appallingly bad in terms of results so I need to bring things back in line in round three, which is where you wonderful people come in. today we're celebrating the imminent release of the new Tau codex (well, I am, I'm not so sure about my opponents). Hi all, and welcome to the second article of the list writing section of my army building series. Today I'm going to look at critically assessing the units within your codex and their strengths and weaknesses, and how they can contribute to a coherent, synergistic strategy. Tau Hunter Contingent - the busted part you didn't notice! Hi guys, well I'll be honest I'm psyched for the new tau codex, my FLGS has my order in and so I should be getting it on Saturday. It's fair to say I've been quite eagerly trawling the interwebs therefore for the last few weeks to find out as much as I can, and I think I've noticed something pretty evil that I've not seen mentioned anywhere else. Apologies to those of you who have picked up on it but I've not seen anything specifically mention this. Hi all, I've got a battle report for you today, from the Tale of 5 Gamers we're running at my club, MAD wargaming. This was a game between myself and George, who's got a fledgling Dark Eldar force on the way (ok, mainly it's stuff borrowed from me and proxied at the moment). It was a 750pt game, and we played on a 4'x4' table, fighting for 4 objectives using the eternal war crusade mission. A whole day painting - how much did I get done? after the mania of the last couple of weeks I've finally got s bit of time to sit down and just do a proper painting post again! Rest assured, there's plenty more coming in the army builder series, but yesterday my wonderful wife took both our daughters out and left me at home for the whole day (actually, come to think of it she only brought one of them back - must ask her about that), which meant that I got to get the paint brushes out and have a really good go at things for a change, instead of doing half an hour here and there. As always with days like this, my ambition far outstripped my ability, but there's nothing wrong with aiming high is there? Hi all, welcome to the third article in my army building series - we've already looked at an overview of list writing, and introducing you to the idea of creating a background story for your collection, so today let's have a quick look at the basics of building and painting the miniatures that are the focus of this hobby. I thought I'd start by listing all the key tools and materials that I have stashed around various places that I use for my construction and painting projects. This is probably a small list in comparison to some of the more ambitious modellers and painters out there - but it'll certainly take you to a decent level. Tau Obsidian Enclave Painting update, plus Dreadtober! Hi all, pic heavy post for you today - it's ages since I did a proper painting progress update, so I've got a complete pic dump for you of all the pictures I've taken of the Obsidian Enclave. I'll be doing more regular progress updates again in the future! 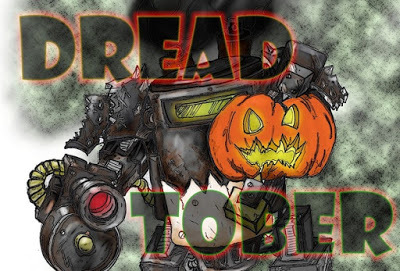 In the meantime, you can see my latest progress pic for the Dreadtober challenge over at Feed Your Nerd above. He's nearly there, some silver and detailing left to do. Morning all and welcome to the third of my Dark Elf player reviews. All my analysis is done from a league point of view, so whilst I will touch briefly on the basic abilities of the players, it’ll mainly be looking at how they perform using the league rules. I’ve cut down the previous style of my player reviews so they’re hopefully not quite so lengthy, and give you a bit more of a strong direction as to how I see the player working within the game, and directions for development. As ever, these analyses will be solely my own work and my own opinion – feel free to disagree with me and comment in the section below, if it makes sense I may even agree with you! Greetings all, and welcome once more to the wickedly whimsical wanderings of my mind as I discuss with you how the Tale of X Gamers series is progressing at my club. Hi all, and welcome to the second article of my army building series - this time we'll be looking at building a background for your collection, and everything that this entails, from the simplest of elements such as a paint scheme to the most complex and detailed elements like naming characters, and fleshing out individual background stories for them all. Strap yourselves in, it's gonna be a fluffy ride! Tau formations - a few thoughts. 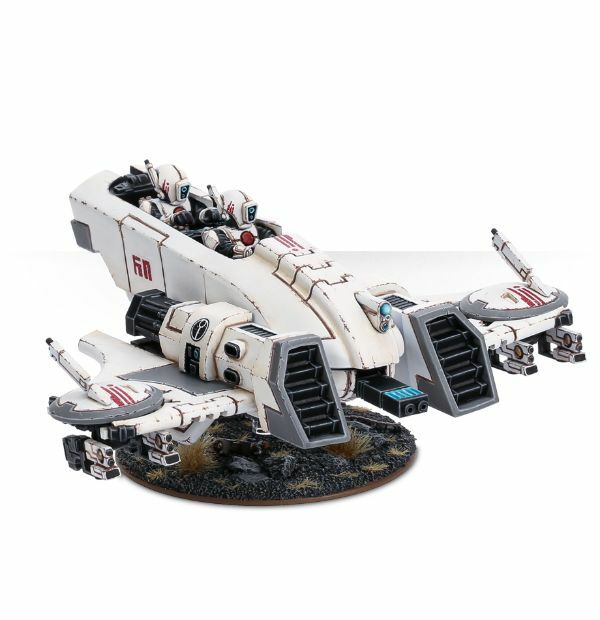 Howdy all, I thought I'd post up today a few thoughts I've had about the Tau collections we can see on their website. We've seen these aplenty before, but some sharp eyed soul spotted that three of the formations detailed actually refer to them being detailed in the Tau codex. Now as there are no formation in the current Tau codex we can be pretty certain that they are from the forthcoming book instead. I have had a look myself on the website just cos I'm nosey, but it also occurred to me that the text also gave us, in a couple of instances at least, an idea as to what the formation bonuses might actually try to achieve! Let's start with the one I'm most likely to be interested in, cos you know, it's my blog and I can do things like that. 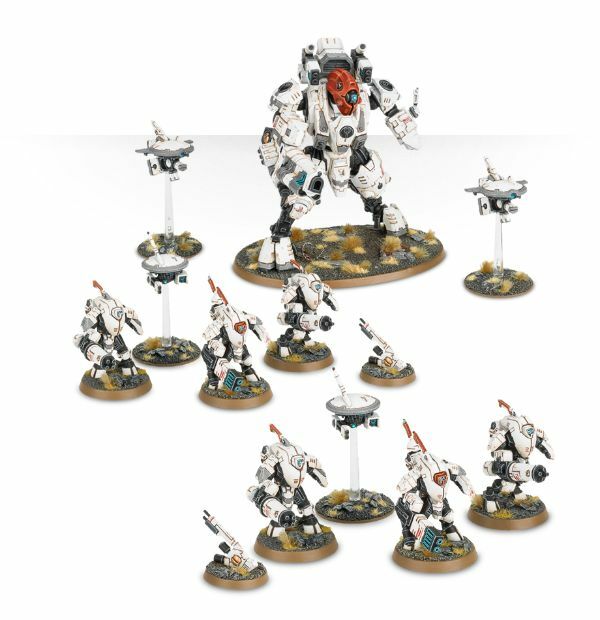 The collection includes 6 stealth suits, seemingly in two squads, and a Ghostkeel, and the flavour text has this to say about the formation. Their stealth fields are networked using a technique known as mesme’j’kaara - the wall of mirrors - which utterly blinds targeting sensors with a mesh of interlocking obfuscation fields, making the weaving, undulating movements of the squad completely unpredictable. So, we know that these units all have stealth and shrouded anyway, so what benefit could be achieved by linking their stealth fields? Well the text talks about blinding targeting sensors, so could we be seeing enemies forced to snap shoot if the units are close enough together? 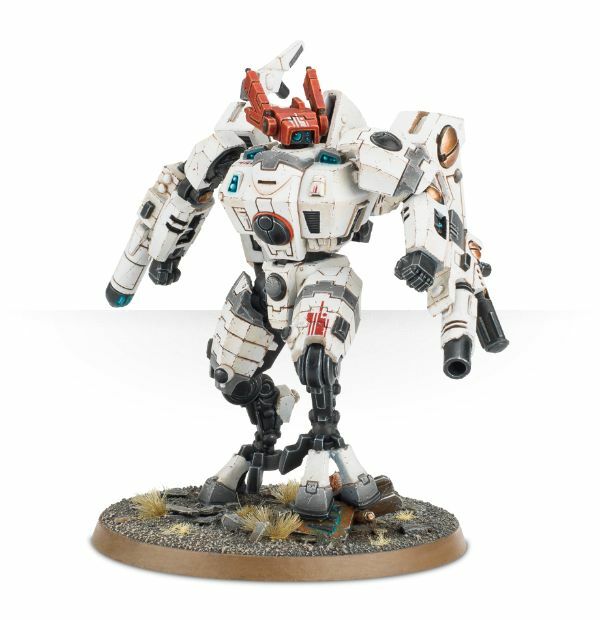 Alternatively, it also talks about 'The Squad' so could it mean that the six stealth suits and the Ghostkeel can be taken as a single unit? My other thought is that perhaps the cadre might give stealth and/or shrouded to units behind them in addition to the usual 5+ cover save for partially obscuring a target. I'm crossing my fingers and hoping for the benefit to be that they're taken as a squad, which would drastically improve the firepower output of the ghostkeel! This formation is made up of three Ghostkeels and two Stormsurges, which is a pretty hefty investment in both points and money no matter which way you look at it (way out of my league at the moment!). The flavour text has this to say. Three Ghostkeel Battlesuits lead the charge, spotting and advising, while two Stormsurges absorb their data, take aim, and annihilate. I think this one is pretty clear, and we've probably seen something similar in the Adeptus Astartes codex, using the Ghostkeels to improve the aim of the Stormsurges behind them. My money is on either a generic boost to BS (though that would tread a little on the toes of marker lights) or, more likely, twin linking the Stormsurges main weapons. Finally we have a tank formation, three Hammerheads (with their new TX7 designation) and a skyray. I'm betting most Tau players would have preferred it the other way round, though let's wait and see if the Hammerhead gets a buff. Screaming, roaring jet engines herald the arrival of the TX7 Hammerhead Gunships, and the Sky Rays assist them, streaking blue contrails peppering the skies with their messages of hyperspeed death. This is probably the least obvious of all the text clues. There are a few potential options though. The roaring jet engines may indicate the cadre could be deployed via deep strike? Streaking blue contrails peppering the skies with messages of hyperspeed death - could the Hammerheads have Skyfire??? Or are we looking at some form of preliminary bombardment style rule where the vehicles get to fire from off-table before they arrive into the game? I'm excited, as the formation benefits here may convince me to invest in this formation, I do love the Hammerhead model. 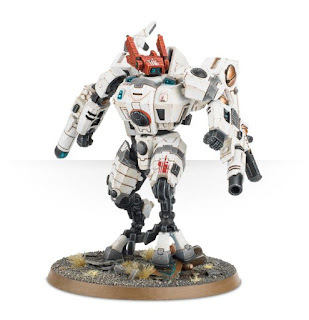 That leaves us with three model collections left on the page, The Ghostkeel Wing and the Mobile Assault Force Stormsurge are pretty self explanatory I think, as they can both be taken in units of three, so having them in a collection is reasonable. That leaves us with the Firebase Support Cadre (Notice how the three formations above are also referred to as Cadres?). 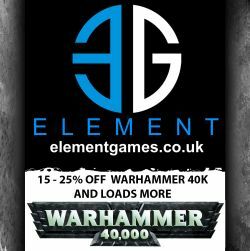 This was released ages ago as a dataslate, but I do wonder if it will remain supported and usable in games of 40k as it's still on the website and referred to by the same term as the other formations. What worries me however is that the website doesn't state it's included in the codex as it does for the other three, which leads me to think it might be discontinued (that being said, it's also the only one that obviously hasn't been updated to the new paint scheme so may just be awaiting a re-write). What do you reckon, am I way off?